My colleague Roshelle Ritzenthaler and I recently presented at South by Southwest on “How to Give Design a Seat at the Lean Startup Table.” There was a line around the corner for our talk, which tells me this is a topic on a lot of designers' minds. If you’re familiar with the two methodologies (Design Thinking and Lean Startup) as they relate to product or service development, then you know they don’t seem to have much in common on the surface. However, if you take a deeper look, you’ll find there are some best practices that build upon the common ground and tensions that are inherent to both methodologies. First, let’s look at the common ground between the Design and Lean Startup methodologies and then where there is some tension before revealing five best practices that integrate the best of both worlds. Get out of the building. Talk to customers. Insight and innovation won’t happen sitting at your desk. Acknowledge and manage uncertainty. We live in a world of extreme uncertainty. The world is always changing so we need to build that into the approach. Iterate in the development. The process should be very iterative – adjusting the approach, tools and next steps as we learn more. Prototype early and often. Make it real as quickly as you can. Get out of the building. Design seeks deep human understanding in the form of empathetic research and discovery, while Lean Startup often skips this step in lieu of quick customer feedback about an idea. Acknowledge and manage uncertainty. Lean Startup manages uncertainty by adhering to a strict process. Design, however, believes you can’t necessarily “manage” uncertainty. Design embraces the uncertainty with divergent thinking and manages it by innovating from the future. Iterate in the development. Design iterates beyond what feels like the scope of the work (embraces a reframe of the problem and divergent thinking) while Lean Startup iterates (or pivots) within a tightly defined area of inquiry related to the solution or idea. Prototype early and often. Design prototypes more to learn and may not have “metrics” to relay the findings while Lean Startup uses Minimum Viable Products (MVPs) to experiment in a very data-driven fashion. As you can see, the friction arises in part because Design is more rooted in exploration while a Lean Startup is more rooted in experimentation. Additionally, there is some tension because, as good as Eric Ries is at explaining the principles of the Lean Startup in his book, his references to “design” are limited and his definition of Design is mostly limited to aesthetics (see page 109). While he calls out some of the similarities between Design and Lean Startup, he suggests that Design creates impractical deliverables (see page 93). So, for the sake of not being vague, let’s be clear that when we say Design we are talking about more than aesthetics and usability. We’re talking about building emotional connections and meaningful experiences that are rooted in empathetic understanding of people and problem solving. We also know that Design really does matter – you don’t need to run an experiment to measure it. It’s a “critical known” to put it in Lean Startup terms. Design-led companies in the S&P 500 show a 211 percent return over their non-design-led peers, according to the Design Management Institute’s 2015 Design Value Index. 1. Convene a hybrid team. This is about more than job titles – it’s about competencies in a few different ways. First, it means ensuring that a strategic design thinker (not only a graphics or UX designer) is part of the core team and given equal voice as other team members. Additionally, this hybrid team needs to have a clear decider that can keep progress moving. Third, everyone on the team needs to be truly ambidextrous — as comfortable designing an experiment as they are an experience, because their role will evolve every day. 2. Find your horizon. This draws from the Three Horizons of Growth framework as described in the book the Alchemy of Growth. In short, Horizon One is business as usual, Horizon Two is composed of emerging ideas to support today’s business, and Horizon Three is composed of many seed ideas and ventures that may not materialize but need to be explored to feed growth. With that in mind, it’s important to recognize what Horizon you are really working on and to match the approach to the Horizon. Design has a place in all three Horizons, especially in Two and Three, while Lean Startup methods are a better fit for Horizon One and some Horizon Two initiatives. 3. Borrow from the designer’s toolkit. 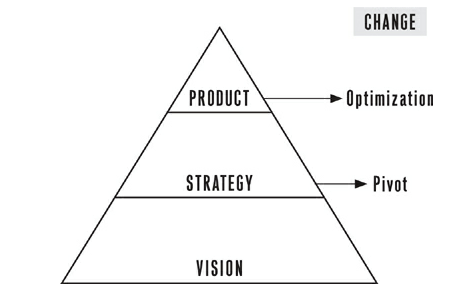 The team needs to clearly visualize the “conceptual center” of the effort across all layers of the Lean Startup vision, strategy and product pyramid – making the invisible visible. A product via an MVP is relatively easy for the team to understand and visualize (because we need to make it real to test it), but vision and strategy are more amorphous. Tools that are core to a designer’s toolkit like service blueprints and experience maps help teams visualize complex ideas and experiences, uncover any inconsistencies, and create a shared vision for the future. 4. Look for opportunities to diverge. Lean teams are incredibly focused and deliberate about testing out uncertainty related to one idea. Design, however, invites divergence into the process because it allows for new ideas and solutions. Allowing for divergence –within limits – and re-casting experimentation as opportunities for linear divergence allows for the best of both worlds. This approach can be especially valuable when a team faces challenges such as product/market fit. So, if you’re questioning the next step in developing your MVP, take a step back and allow the team to diverge and generate new options — it can be for an hour, a day or a week, but always within limits. 5. Don’t confuse empathy with experimentation. Empathy is the ability to understand and share the feelings of another. Just because you got “out of the building” and talked to 80 people for 10 minutes each, that’s probably not empathy. Empathy is achieved through giving context to the problem, not speed and quantity of interviews. The more understanding there is for the customer beyond a solution or a problem and the more we understand “why” people do what they do, the more room there is to pivot – and to pivot quickly when there are challenges. With these five best practices in place, Lean Startup and Design teams can both have a seat at the table and create long-lasting business models as well as meaningful products and experiences. Click here for Roshelle Ritzenthaler's observations on SxSW Interactive 2017.